Azure StorSimple is a hybrid cloud storage solution from Microsoft. StorSimple addresses the complexities of exponential data growth by using an Azure Storage account as an extension of the on-premises solution and automatically tiering data across on-premises storage and cloud storage. 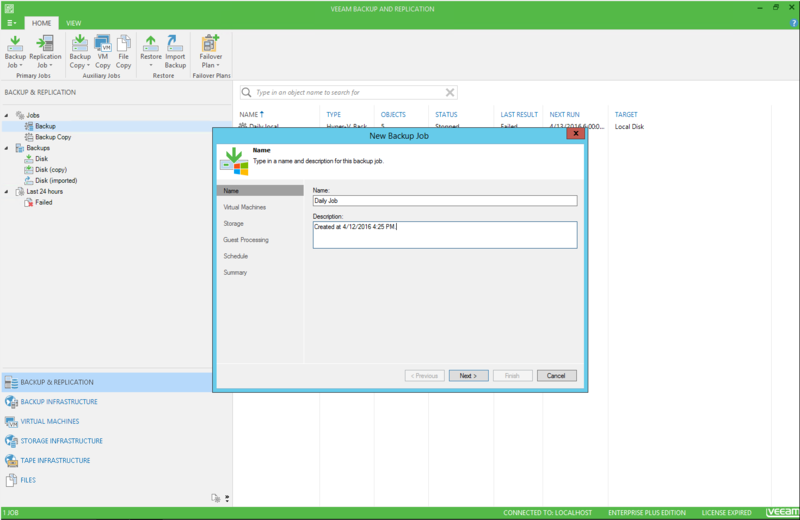 In this article, we discuss StorSimple integration with Veeam, and best practices for integrating both solutions. 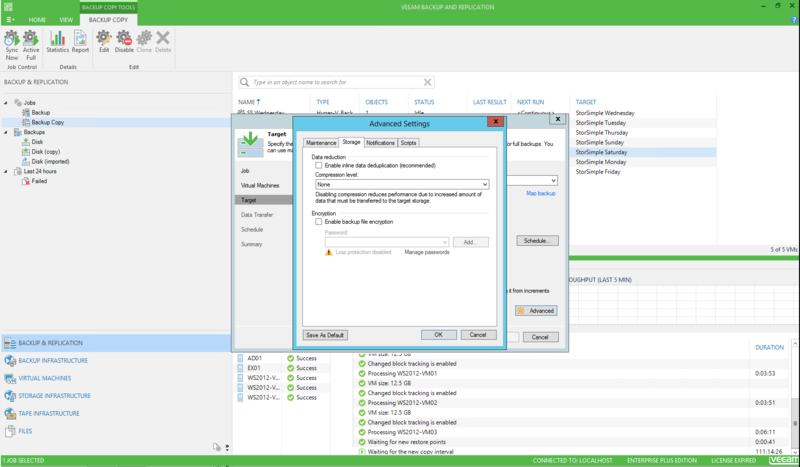 We also make recommendations on how to set up Veeam to best integrate with StorSimple. 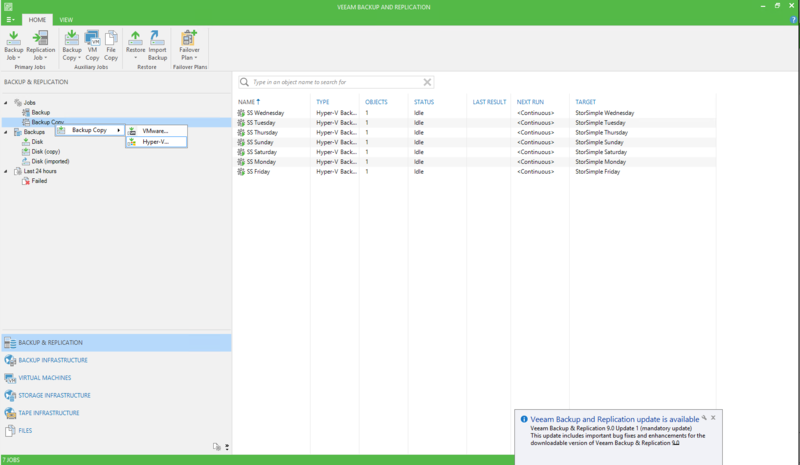 We defer to Veeam best practices, backup architects, and administrators for the best way to set up Veeam to meet individual backup requirements and service-level agreements (SLAs). Although we illustrate configuration steps and key concepts, this article is by no means a step-by-step configuration or installation guide. We assume that the basic components and infrastructure are in working order and ready to support the concepts that we describe. The information in this article will be most helpful to backup administrators, storage administrators, and storage architects who have knowledge of storage, Windows Server 2012 R2, Ethernet, cloud services, and Veeam. 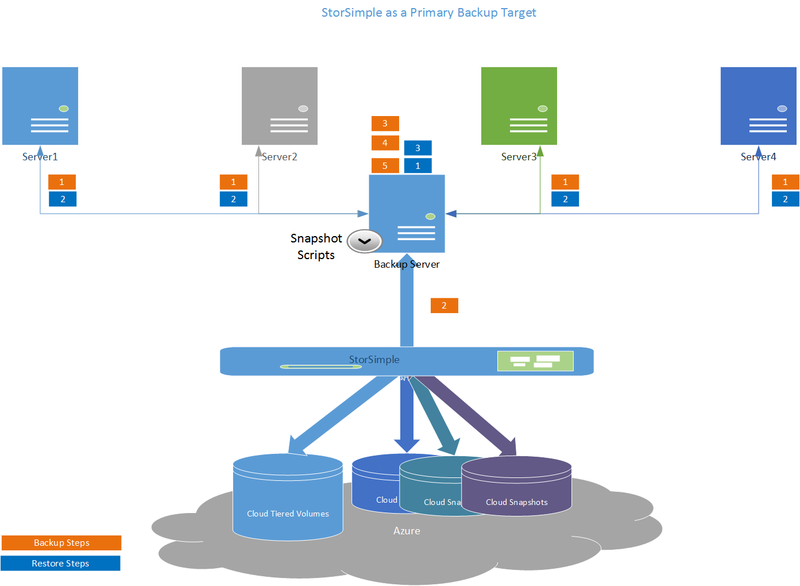 Why StorSimple as a backup target? It provides standard, local storage for backup applications to use as a fast backup destination, without any changes. You also can use StorSimple for a quick restore of recent backups. Its cloud tiering is seamlessly integrated with an Azure cloud storage account to use cost-effective Azure Storage. It automatically provides offsite storage for disaster recovery. As with any storage solution, a careful assessment of the solution’s storage performance, SLAs, rate of change, and capacity growth needs is critical to success. The main idea is that by introducing a cloud tier, your access times and throughputs to the cloud play a fundamental role in the ability of StorSimple to do its job. StorSimple is designed to provide storage to applications that operate on a well-defined working set of data (hot data). In this model, the working set of data is stored on the local tiers, and the remaining nonworking/cold/archived set of data is tiered to the cloud. This model is represented in the following figure. The nearly flat green line represents the data stored on the local tiers of the StorSimple device. The red line represents the total amount of data stored on the StorSimple solution across all tiers. 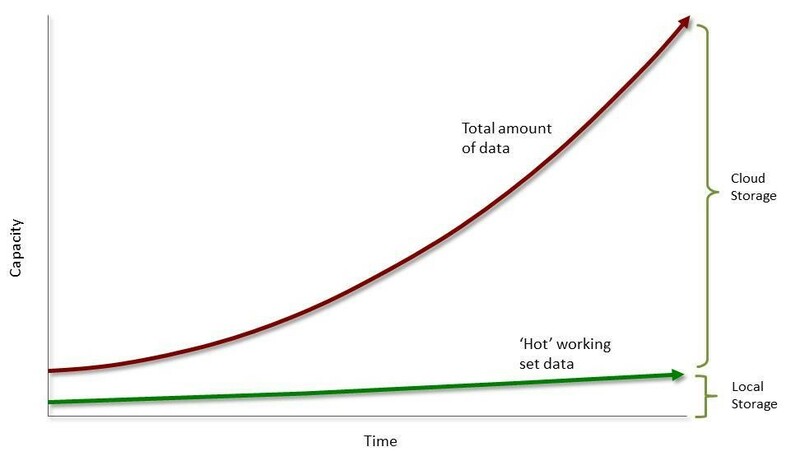 The space between the flat green line and the exponential red curve represents the total amount of data stored in the cloud. Perform your most frequent restores from the local working set of data. Use the cloud for offsite disaster recovery and older data, where restores are less frequent. StorSimple provides an on-premises solution that is seamlessly integrated with Microsoft Azure, by taking advantage of seamless access to on-premises and cloud storage. StorSimple uses automatic tiering between the on-premises device, which has solid-state device (SSD) and serial-attached SCSI (SAS) storage, and Azure Storage. 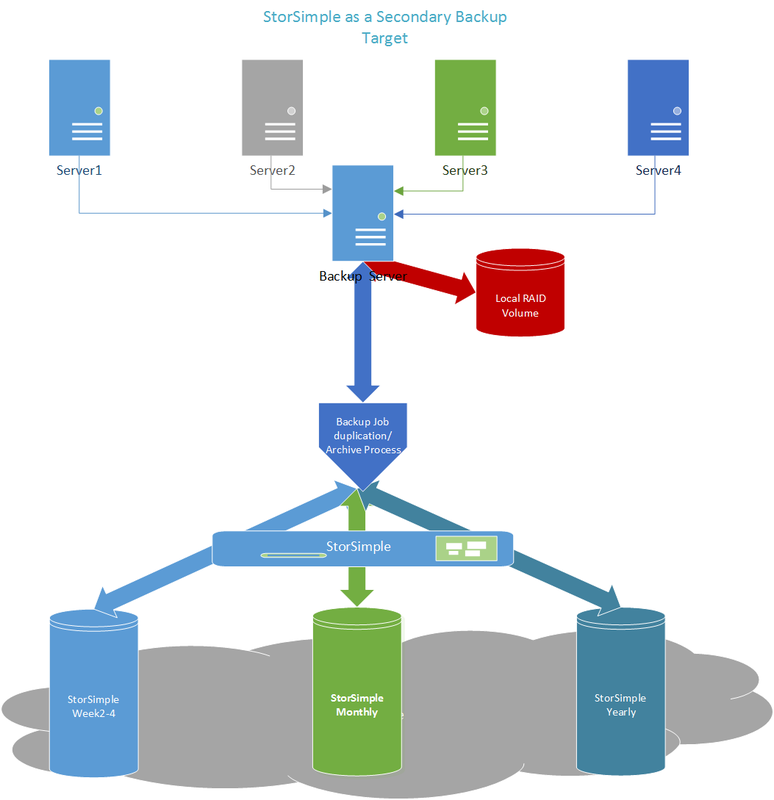 Automatic tiering keeps frequently accessed data local, on the SSD and SAS tiers. It moves infrequently accessed data to Azure Storage. Although StorSimple presents two main deployment scenarios (primary backup target and secondary backup target), fundamentally, it's a plain, block storage device. StorSimple does all the compression and deduplication. It seamlessly sends and retrieves data between the cloud and the application and file system. For more information about StorSimple, see StorSimple 8000 series: Hybrid cloud storage solution. Also, you can review the technical StorSimple 8000 series specifications. Using a StorSimple device as a backup target is supported only for StorSimple 8000 Update 3 and later versions. The following tables show the device model-to-architecture initial guidance. * Storage size assumes no deduplication or compression. In this scenario, StorSimple volumes are presented to the backup application as the sole repository for backups. 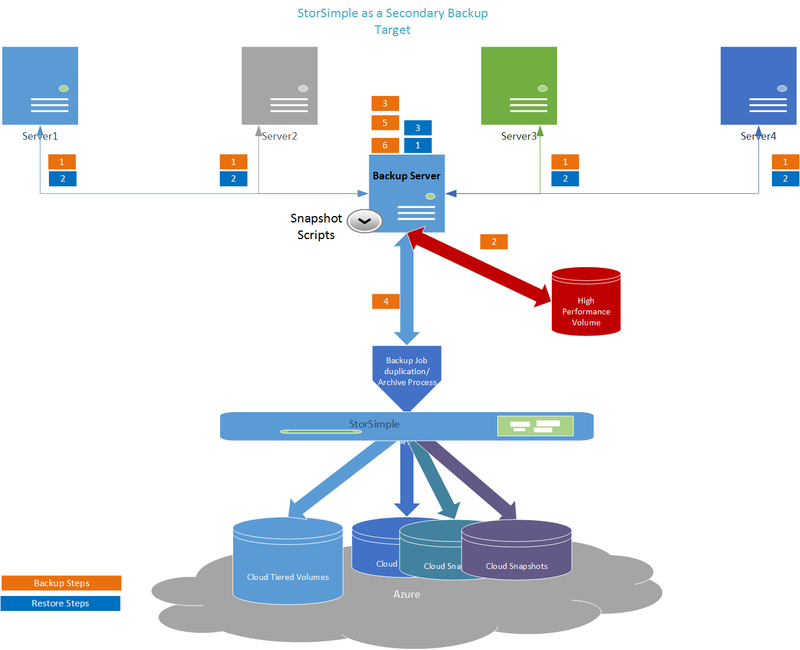 The following figure shows a solution architecture in which all backups use StorSimple tiered volumes for backups and restores. The backup server contacts the target backup agent, and the backup agent transmits data to the backup server. The backup server writes data to the StorSimple tiered volumes. The backup server updates the catalog database, and then finishes the backup job. A snapshot script triggers the StorSimple cloud snapshot manager (start or delete). The backup server deletes expired backups based on a retention policy. The backup server starts restoring the appropriate data from the storage repository. The backup agent receives the data from the backup server. The backup server finishes the restore job. In this scenario, StorSimple volumes primarily are used for long-term retention or archiving. The following figure shows an architecture in which initial backups and restores target a high-performance volume. These backups are copied and archived to a StorSimple tiered volume on a set schedule. It is important to size your high-performance volume so that it can handle your retention policy capacity and performance requirements. The backup server writes data to high-performance storage. 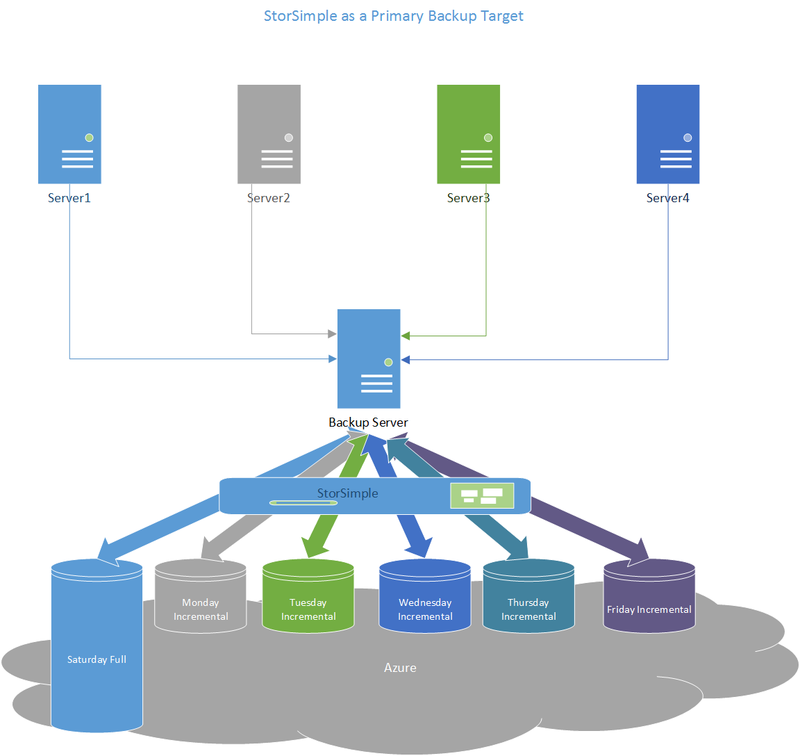 The backup server copies backups to StorSimple based on a retention policy. Deploy your StorSimple device as a backup target. Each step is discussed in detail in the following sections. Because StorSimple is a solution that is integrated with the Azure cloud, StorSimple requires an active and working connection to the Azure cloud. This connection is used for operations like cloud snapshots, data management, and metadata transfer, and to tier older, less accessed data to Azure cloud storage. The link that connects your StorSimple tiering to Azure must meet your bandwidth requirements. Achieve this by applying the necessary Quality of Service (QoS) level to your infrastructure switches to match your RPO and recovery time objective (RTO) SLAs. Maximum Azure Blob storage access latencies should be around 80 ms.
For step-by-step StorSimple deployment guidance, see Deploy your on-premises StorSimple device. 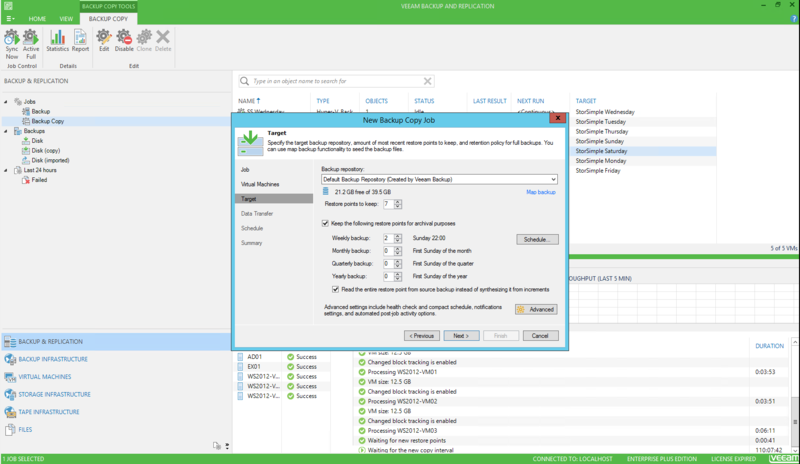 For Veeam installation best practices, see Veeam Backup & Replication Best Practices, and read the user guide at Veeam Help Center (Technical Documentation). In this section, we demonstrate some configuration examples. The following examples and recommendations illustrate the most basic and fundamental implementation. This implementation might not apply directly to your specific backup requirements. Deploy your on-premises StorSimple device. Supported versions: Update 3 and later versions. Turn on the backup target. Use these commands to turn on or turn off backup target mode, and to get status. For more information, see Connect remotely to a StorSimple device. To turn on backup mode: Set-HCSBackupApplianceMode -enable. To turn off backup mode: Set-HCSBackupApplianceMode -disable. To get the current state of backup mode settings: Get-HCSBackupApplianceMode. Create a common volume container for your volume that stores the backup data. All data in a volume container is deduplicated. StorSimple volume containers define deduplication domains. Create StorSimple volumes. Create volumes with sizes as close to the anticipated usage as possible, because volume size affects cloud snapshot duration time. For information about how to size a volume, read about retention policies. Use StorSimple tiered volumes, and select the Use this volume for less frequently accessed archival data check box. Using only locally pinned volumes is not supported. Create a unique StorSimple backup policy for all the backup target volumes. A StorSimple backup policy defines the volume consistency group. Disable the schedule as the snapshots expire. Snapshots are triggered as a post-processing operation. Don't use spanned volumes (created by Windows Disk Management). Spanned volumes are not supported. Format your volumes using NTFS with 64-KB allocation unit size. 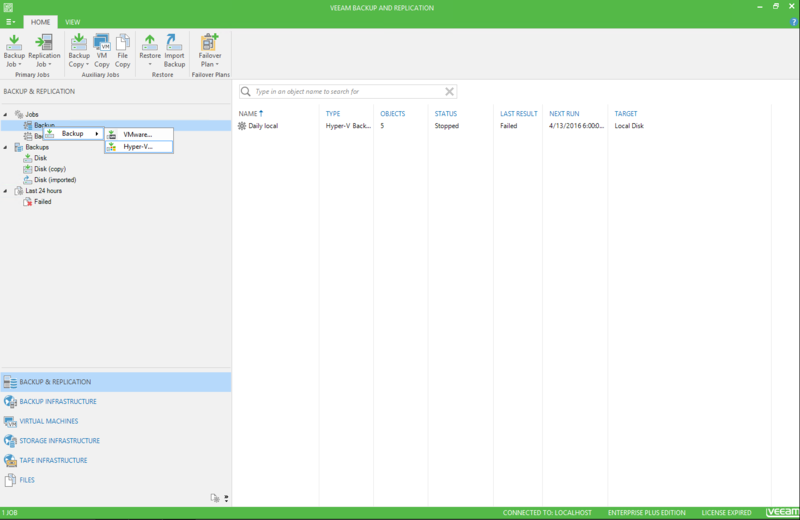 Map the StorSimple volumes directly to the Veeam server. Use iSCSI for physical servers. Set up your solution according to the guidelines in the following few sections. 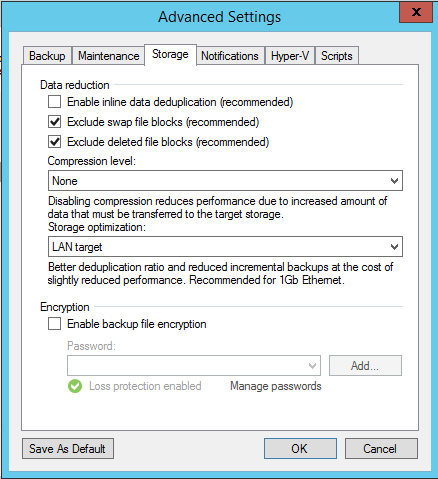 Disable Windows Server encryption and deduplication for the NTFS file system. Disable Windows Server defragmentation on the StorSimple volumes. Disable Windows Server indexing on the StorSimple volumes. Run an antivirus scan at the source host (not against the StorSimple volumes). Turn off the Maintenance configurator in Windows Task Scheduler. Be sure that the StorSimple device is updated to Update 3 or later. Isolate iSCSI and cloud traffic. Use dedicated iSCSI connections for traffic between StorSimple and the backup server. Be sure that your StorSimple device is a dedicated backup target. Mixed workloads are not supported because they affect your RTO and RPO. The Veeam database should be local to the server and not reside on a StorSimple volume. 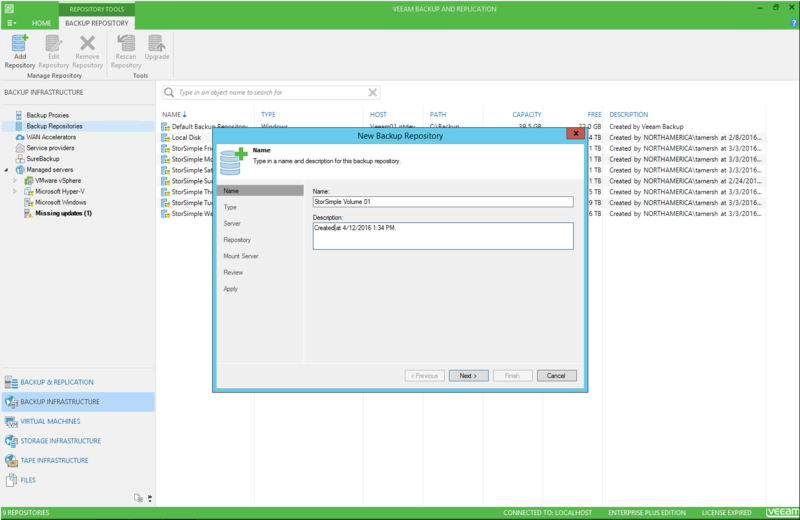 For disaster recovery, back up the Veeam database on a StorSimple volume. We support Veeam full and incremental backups for this solution. We recommend that you do not use synthetic and differential backups. Backup data files should contain only the data for a specific job. For example, no media appends across different jobs are allowed. Turn off job verification. If necessary, verification should be scheduled after the latest backup job. It is important to understand that this job affects your backup window. Be sure parallel processing is turned on. Turn off deduplication on the backup job. Set optimization to LAN Target. Turn on Create active full backup (every 2 weeks). On the backup repository, set up Use per-VM backup files. Set Use multiple upload streams per job to 8 (a maximum of 16 is allowed). Adjust this number up or down based on CPU utilization on the StorSimple device. One of the most common backup retention policy types is a Grandfather, Father, and Son (GFS) policy. In a GFS policy, an incremental backup is performed daily and full backups are done weekly and monthly. This policy results in six StorSimple tiered volumes: one volume contains the weekly, monthly, and yearly full backups; the other five volumes store daily incremental backups. Non-deduped or compressed data is used. Full backups are 1 TiB each. Daily incremental backups are 500 GiB each. Four weekly backups are kept for a month. Twelve monthly backups are kept for a year. One yearly backup is kept for 10 years. Based on the preceding assumptions, create a 26-TiB StorSimple tiered volume for the monthly and yearly full backups. Create a 5-TiB StorSimple tiered volume for each of the incremental daily backups. * The GFS multiplier is the number of copies you need to protect and retain to meet your backup policy requirements. 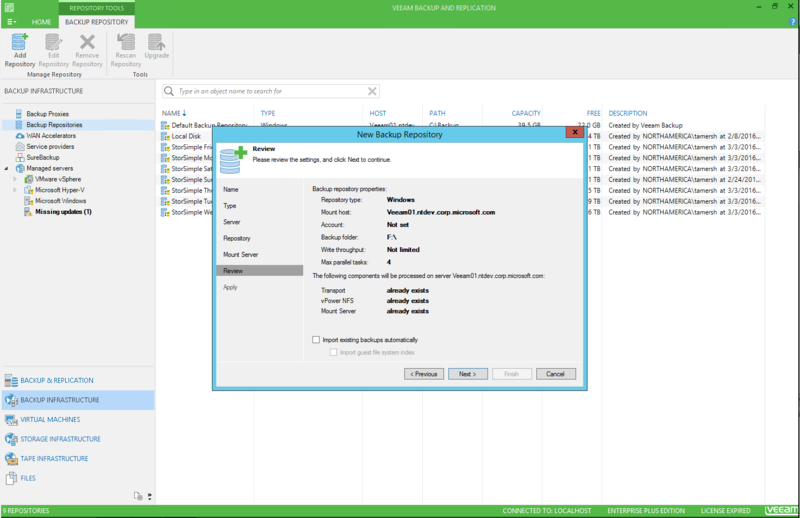 In the Veeam Backup and Replication console, in Repository Tools, go to Backup Infrastructure. Right-click Backup Repositories, and then select Add Backup Repository. In the New Backup Repository dialog box, enter a name and description for the repository. Select Next. For the type, select Microsoft Windows server. 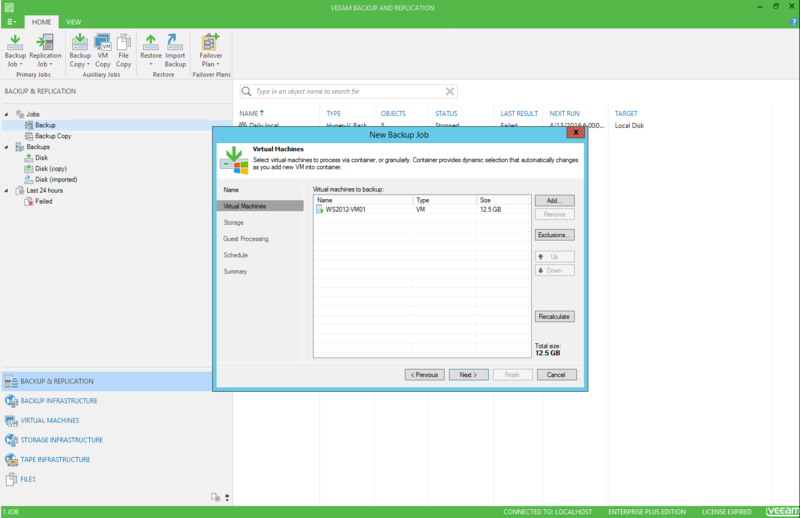 Select the Veeam server. Select Next. To specify Location, browse and select the volume. Select the Limit maximum concurrent tasks to: check box and set the value to 4. This ensures that only four virtual disks are being processed concurrently while each virtual machine (VM) is processed. Select the Advanced button. 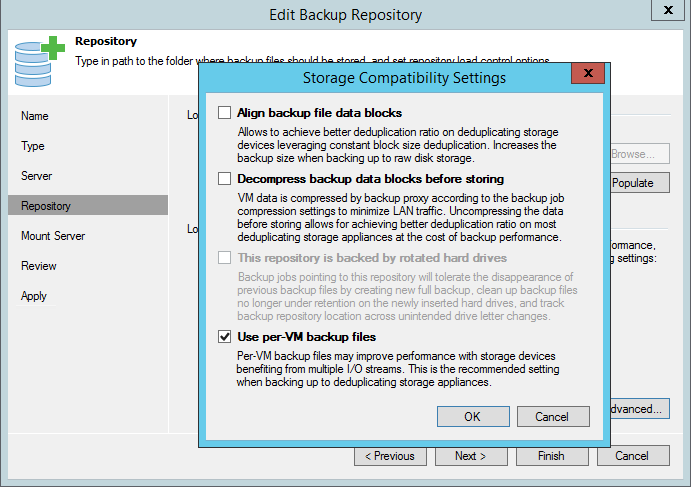 In the Storage Compatibility Settings dialog box, select the Use per-VM backup files check box. In the New Backup Repository dialog box, select the Enable vPower NFS service on the mount server (recommended) check box. Select Next. Review the settings, and then select Next. 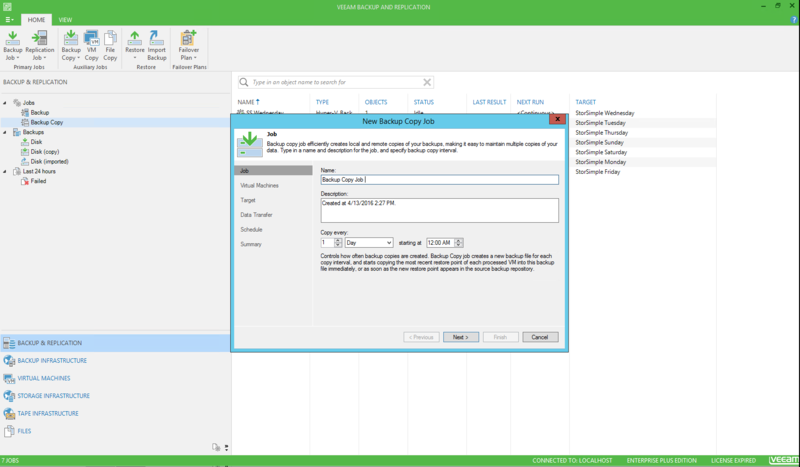 A repository is added to the Veeam server. Data restore from a backup that has been tiered to the cloud occurs at cloud speeds. The following figure shows the mapping of a typical volume to a backup job. In this case, all the weekly backups map to the Saturday full disk, and the incremental backups map to Monday-Friday incremental disks. All the backups and restores are from a StorSimple tiered volume. 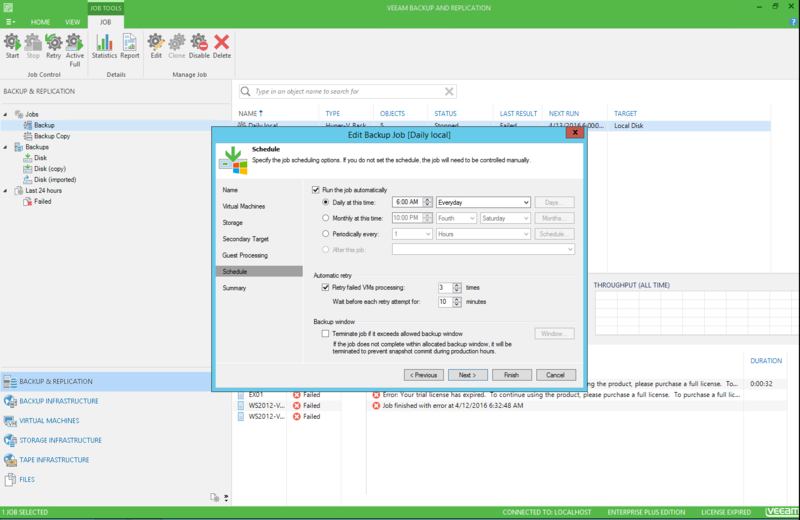 For primary backup target scenario, create a daily job with your primary Veeam StorSimple volume. For a secondary backup target scenario, create a daily job by using Direct Attached Storage (DAS), Network Attached Storage (NAS), or Just a Bunch of Disks (JBOD) storage. 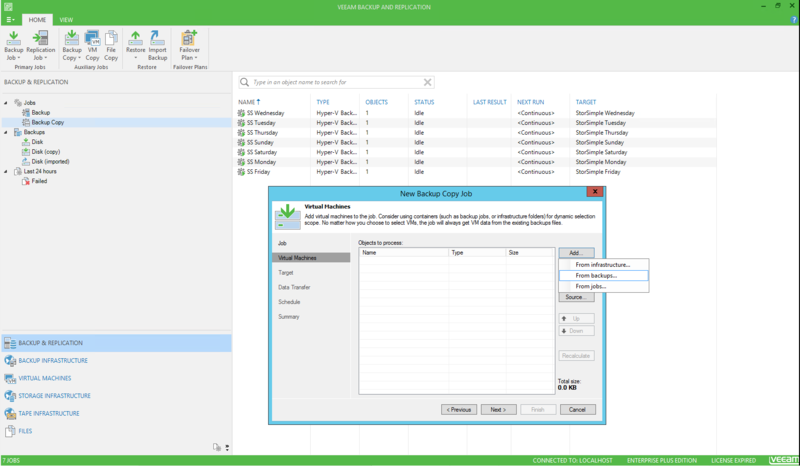 In the Veeam Backup and Replication console, select Backup & Replication. 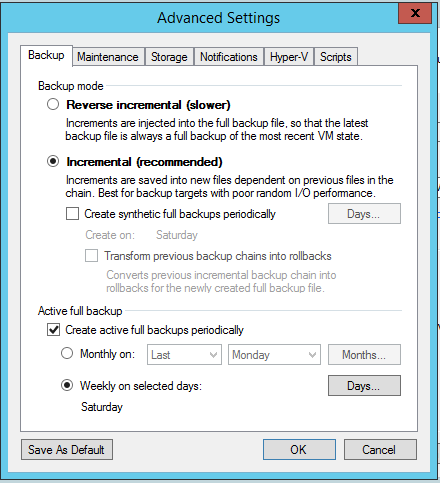 Right-click Backup, and then select VMware or Hyper-V, depending on your environment. In the New Backup Job dialog box, enter a name and description for the daily backup job. Select a virtual machine to back up to. Select the values you want for Backup proxy and Backup repository. Select a value for Restore points to keep on disk according to the RPO and RTO definitions for your environment on locally attached storage. Select Advanced. In the Advanced Settings dialog box, on the Backup tab, select Incremental. Be sure that the Create synthetic full backups periodically check box is cleared. Select the Create active full backups periodically check box. Under Active full backup, select the Weekly on selected days check box for Saturday. On the Storage tab, make sure that the Enable inline data deduplication check box is cleared. Select the Exclude swap file blocks check box, and select the Exclude deleted file blocks check box. Set Compression level to None. For balanced performance and deduplication, set Storage optimization to LAN target. 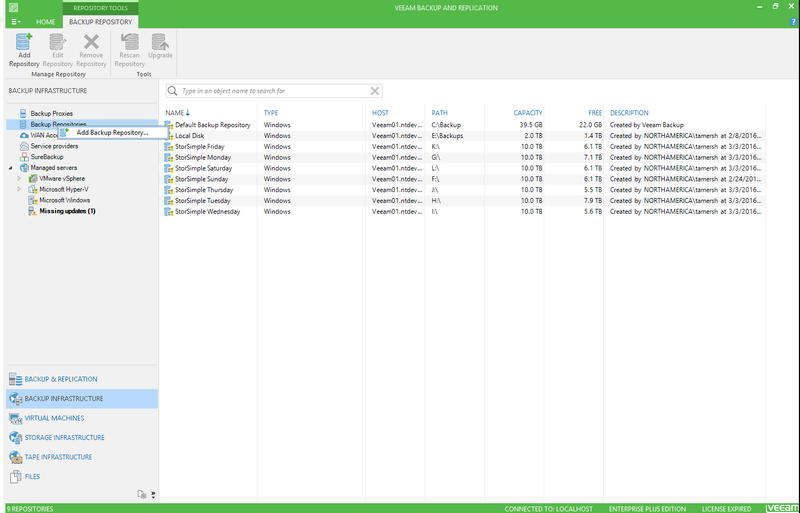 Select OK.
For information about Veeam deduplication and compression settings, see Data Compression and Deduplication. In the Edit Backup Job dialog box, you can select the Enable application-aware processing check box (optional). Set the schedule to run once daily, at a time you can specify. Data restores from a backup that has been tiered to the cloud occur at cloud speeds. In this model, you must have a storage media (other than StorSimple) to serve as a temporary cache. For example, you can use a redundant array of independent disks (RAID) volume to accommodate space, input/output (I/O), and bandwidth. We recommend using RAID 5, 50, and 10. The following figure shows typical short-term retention local (to the server) volumes and long-term retention archive volumes. In this scenario, all backups run on the local (to the server) RAID volume. These backups are periodically duplicated and archived to an archive volume. It is important to size your local (to the server) RAID volume so that it can handle your short-term retention capacity and performance requirements. The following table shows how to set up backups to run on the local and StorSimple disks. It includes individual and total capacity requirements. * Total capacity includes 17 TiB of StorSimple disks and 1 TiB of local RAID volume. In the New Backup Copy Job dialog box, enter a name and description for the job. Select the VMs you want to process. Select from backups, and then select the daily backup that you created earlier. Exclude objects from the backup copy job, if needed. Select your backup repository, and set a value for Restore points to keep. Be sure to select the Keep the following restore points for archival purposes check box. Define the backup frequency, and then select Advanced. On the Maintenance tab, turn off storage level corruption guard. On the Storage tab, be sure that deduplication and compression are turned off. Specify that the data transfer is direct. Define the backup copy window schedule according to your needs, and then finish the wizard. For more information, see Create backup copy jobs. StorSimple cloud snapshots protect the data that resides in your StorSimple device. 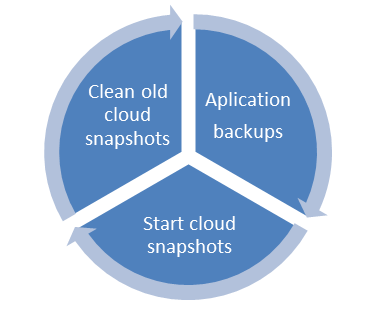 Creating a cloud snapshot is equivalent to shipping local backup tapes to an offsite facility. If you use Azure geo-redundant storage, creating a cloud snapshot is equivalent to shipping backup tapes to multiple sites. If you need to restore a device after a disaster, you might bring another StorSimple device online and do a failover. After the failover, you would be able to access the data (at cloud speeds) from the most recent cloud snapshot. The following section describes how to create a short script to start and delete StorSimple cloud snapshots during backup post-processing. Snapshots that are manually or programmatically created do not follow the StorSimple snapshot expiration policy. These snapshots must be manually or programmatically deleted. Carefully assess the compliance and data retention repercussions before you delete a StorSimple snapshot. For more information about how to run a post-backup script, see the Veeam documentation. The server that runs the script must have access to Azure cloud resources. The user account must have the necessary permissions. A StorSimple backup policy with the associated StorSimple volumes must be set up but not turned on. You'll need the StorSimple resource name, registration key, device name, and backup policy ID. Download and setup Manage-CloudSnapshots.ps1 PowerShell script. 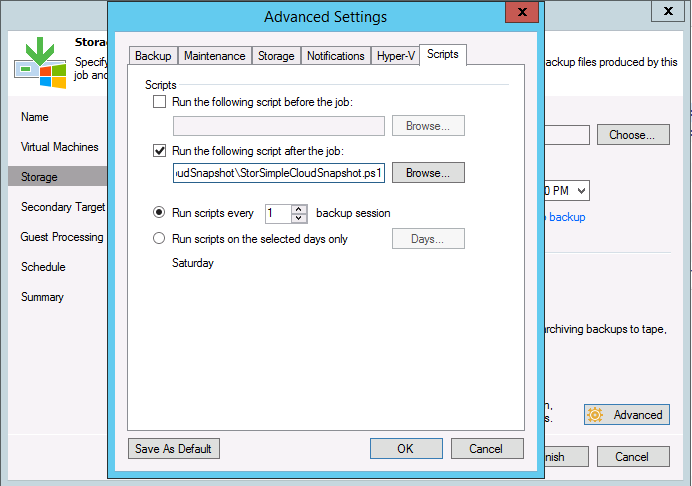 To add the script to your backup job, edit your Veeam job advanced options. We recommend that you run your StorSimple cloud snapshot backup policy as a post-processing script at the end of your daily backup job. For more information about how to back up and restore your backup application environment to help you meet your RPO and RTO, please consult with your backup architect. Restores from a StorSimple device work like restores from any block storage device. Restores of data that is tiered to the cloud occurs at cloud speeds. For local data, restores occur at the local disk speed of the device. For backup target scenarios, StorSimple Cloud Appliance is not supported as a restore target. A disaster can be caused by a variety of factors. The following table lists common disaster recovery scenarios. StorSimple device failure Backup and restore operations are interrupted. Replace the failed device and perform StorSimple failover and disaster recovery. If you need to perform a restore after device recovery, full data working sets are retrieved from the cloud to the new device. All operations are at cloud speeds. The index and catalog rescanning process might cause all backup sets to be scanned and pulled from the cloud tier to the local device tier, which might be a time-consuming process. 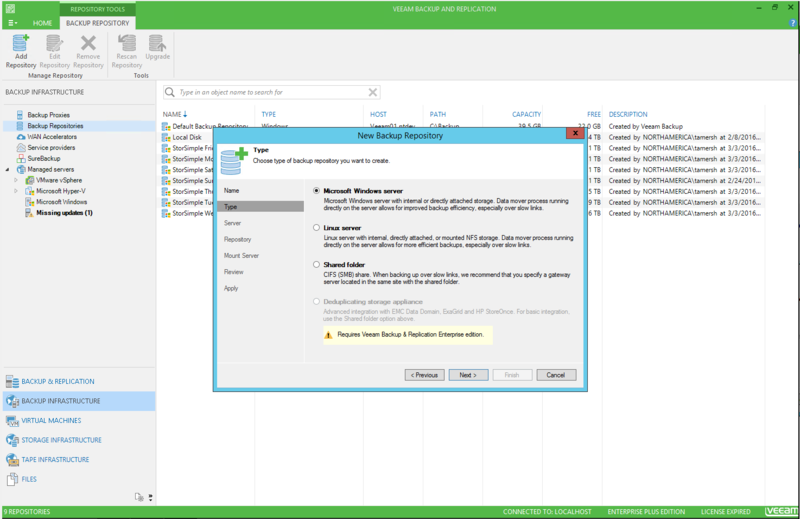 Veeam server failure Backup and restore operations are interrupted. 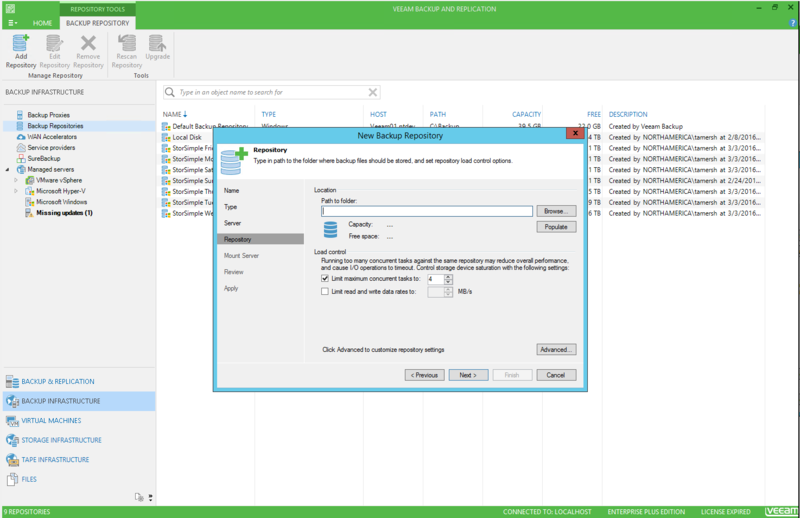 Rebuild the backup server and perform database restore as detailed in Veeam Help Center (Technical Documentation). 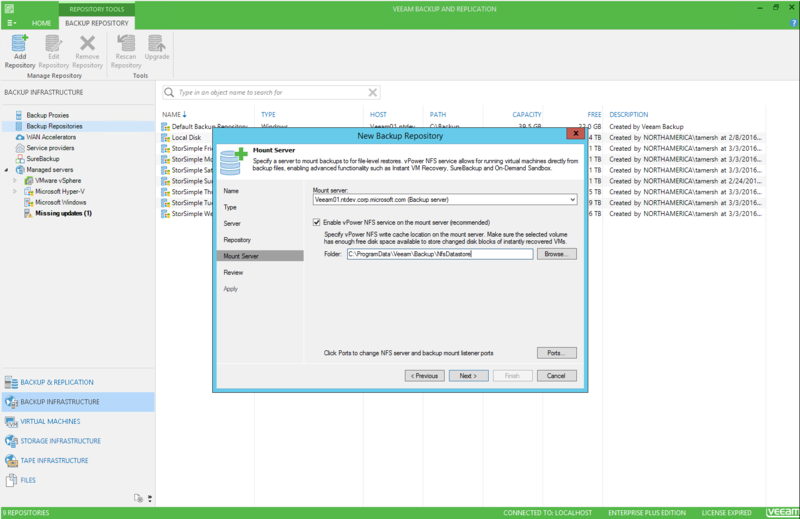 You must rebuild or restore the Veeam server at the disaster recovery site. Restore the database to the most recent point. If the restored Veeam database is not in sync with your latest backup jobs, indexing and cataloging is required. This index and catalog rescanning process might cause all backup sets to be scanned and pulled from the cloud tier to the local device tier. This makes it further time-intensive. Site failure that results in the loss of both the backup server and StorSimple Backup and restore operations are interrupted. 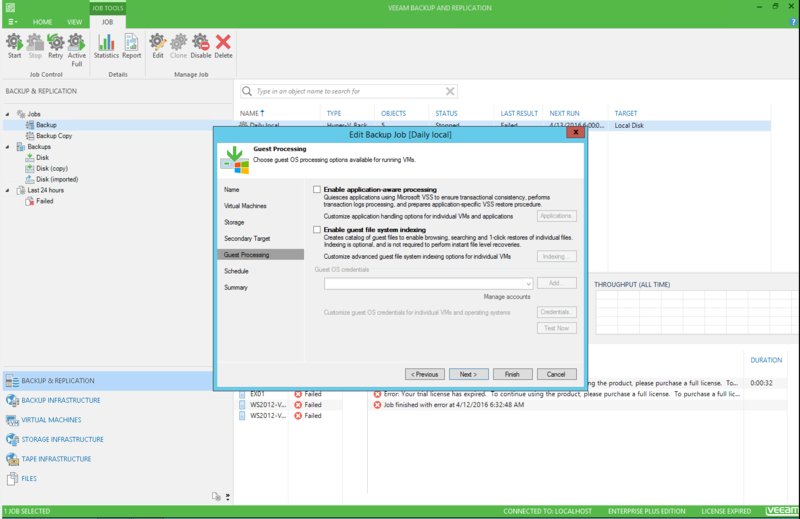 Restore StorSimple first, and then restore Veeam. 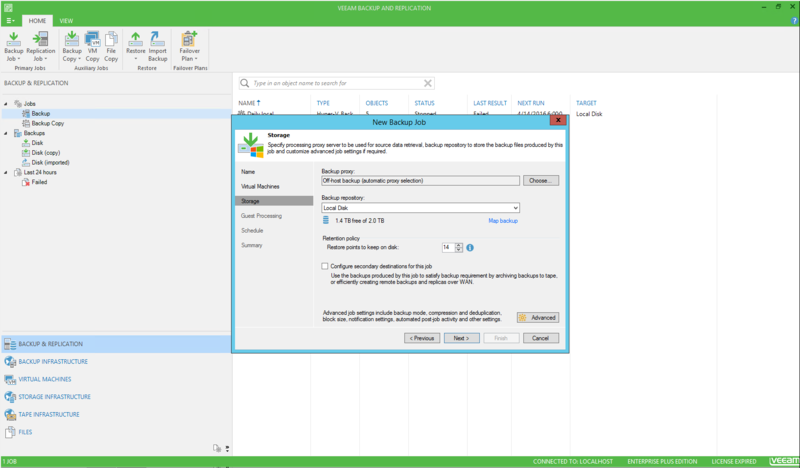 Restore StorSimple first, and then restore Veeam. If you need to perform a restore after device recovery, the full data working sets are retrieved from the cloud to the new device. All operations are at cloud speeds. Learn more about how to restore from a backup set. Learn more about how to perform device failover and disaster recovery.